Today’s Giant Tiger Flyer August 10 2017 is a must for every house and you have to check it out right now! In it, you can find many good deals and products with best prices! There are countless options when it comes to discounts on every day needs such as sausages, drinks, snacks, chickens, bagels and so on. As we said before, you have countless options to check out, so be quick and start browsing. In page 1, you can find many good deals such as Beatrice Chocolate Milk, Johnsonville Sausages, Country Ville bagels or bread and so on. We sure listed the best deals on today’s Giant Tiger Flyer August 10 2017, but do not forget to check all of the deals on HERE. Now, let’s see the deals! In Giant Tiger, you can find lower prices in every day! Just be careful and check out every deals while you can! There are many deals and discounts on today’s flyer and those items are musts for every kitchen, so do not wait for your supply dry and re-supply it while you can! Trophy Almonds or Mixed Nuts, $2.97. 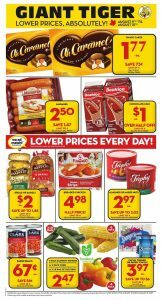 These are the best deals on today’s Giant Tiger Flyer August 10 2017 but there are lots of other options in it too, so do not forget to check it all to. Also, you can become our subscriber and be alert when the new deals come. See you on next deals!